Seiha Translations - View topic - Question? 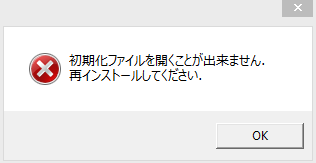 This message popped up while I was trying to open Kamidori today. Does anyone know what this is? The game was running fine earlier this morning (12 hours ago) but then all of a sudden this thing shows up. Fortunately, I was able to get Kamidori running again after restarting my computer but I'm just curious to identify what kind of error this. It says, literally, "Could not detect primary files. Please reinstall." Did you do anything peculiar between this and previous launch? All I really did was hook up a USB cable to my computer to charge my cell phone for the first time. I'm not sure if that had anything to do with this, but it's the only thing I did in between launches.